Royal Portrush will play host to The Open 2019 and you can look forward to seeing all of the action in VIP style with our official Open Golf hospitality packages. The closing practice day before the golf tournament (Wednesday) showcases the world’s finest players as they complete their final preparations ahead of the championship’s opening day on Thursday – it is always a wonderful experience for our guests. Wednesday is the most important days to view practice for The Open 2019. The players are learning the course at Royal Portrush and fine-tuning their shots. If you want to foresee how the following days might play out, seeing the golfing elites tee off on Wednesday will let you see their form in advance of the competition – an insight many miss. Royal Portrush has always occupied top spots in lists of the world’s premier links courses and will proudly host The Open 2019. The Open is one of the most prestigious events in British golf and we are delighted to offer the very finest in VIP hospitality for the event. 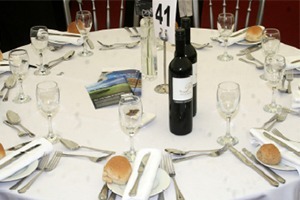 The Champions Club provides the perfect hospitality experience at The Open Championship. Its fantastic location and relaxed environment make it perfect for entertaining clients and guests. We have a dedicated page where you can view, download and print all of our event information for The Open Golf 2019.